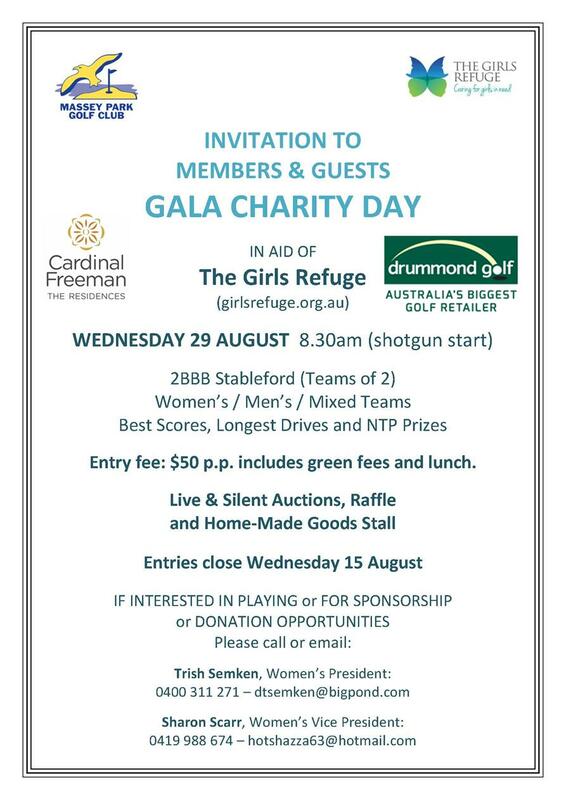 The Massey Park Ladies Committee is excited to announce details of this year’s Charity Gala Day for the benefit of The Girls Refuge in Leichhardt to be held on Wednesday 29th August. The Girls Refuge provides a safe place for girls aged 13 to 17 who are homeless or at risk of homelessness. Money raised from this year will provide funds for their Career Mentoring Program. We have been lucky to secure two major sponsors for the 4BBB Medley Stableford event. Cardinal Freeman Retirement Village has come on board as our major sponsor this year and Drummond Golf Stanmore has once again kindly donated the major prizes. Entries are now open for Women, Men or Mixed teams of two, with a shotgun start at 8:30am, with best scores, straightest drives and NTP to be won ($5 mulligans will be available as well). Entry Forms are available at the pro shop or in the Ladies Locker Room. Of course it’s not all about the golf, as we have a $2 raffle with prizes worth $100 to $1,499 including a laptop computer from Tower Projects and Dr Foot Solutions’ shoes to be won with tickets available on the day. There will be a live auction for fantastic items including a 3 day Aussie Cruise from Hello World Travel Drummoyne, Personal Training vouchers from Vision Training North Strathfield, a round of golf at the newly renovated Concord GC, and NRL Grand Final Tickets. We also hold a silent auction for more than a dozen items, including a signed NSW Cricket Bat, Australian Turf Club vouchers, tickets to Sydney FC Games, Bonville Golf Resort Voucher, Bunnings Gift Cards, Noi Due Restaurant vouchers, movie tickets and much more. And of course for the foodies, our ladies very own homemade cakes, jams and more, will be on sale at the club! 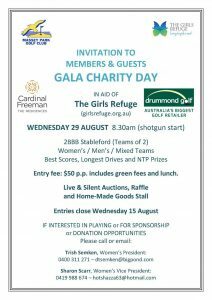 So come and join us for a great day of golf and fun in support of a very important local community program, The Girls Refuge at Leichhardt. For more information please contact our President Trish Semken 0400 311 271 or our Vice President Sharon Scarr on 0419 988 674.